Is there any way to tell which graphics processor is working in a laptop? I have a Dell Inspiron N5010 laptop which has both a discrete GPU (ATI Mobility Radeon HD 5650) and an integrated GP (Intel HD Graphics). A few days ago I started to get BSOD with the atikmpag.sys 0x00000116 error. 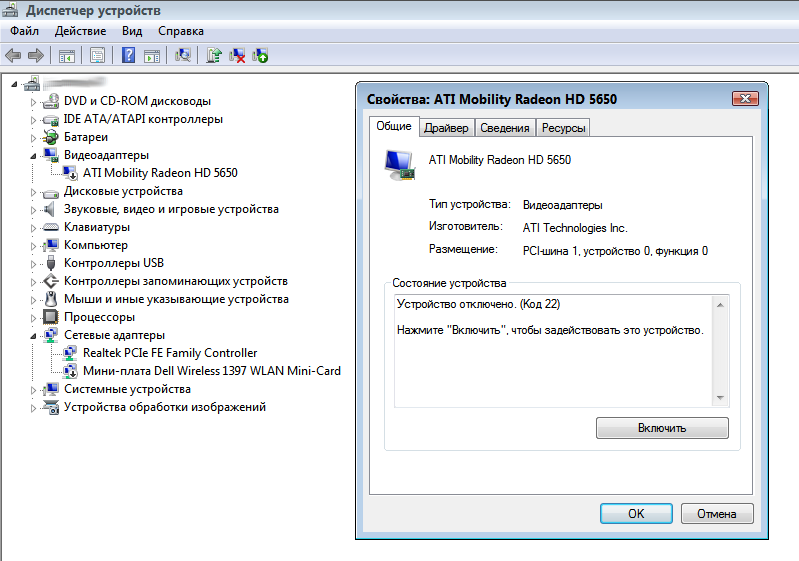 In the device manager I had stopped the ATI driver and now I can use my laptop. In the display properties I read that now it uses the VgaSave driver. My question is: is this driver runs in the integrated GP, or in the discrete GPU? Is there any way to tell? UPDATE 3: I am now really confused. I have been running my laptop for about 5 hours on the VgaSave driver, with ATI driver stopped in the Device Manager. As Fleet Command has suggested, I assumed that the VgaSave driver was running on the inegrated GP. Could you please see the attached picture and tell me why the discrete GPU heats up? I also downloaded the latest version of the OpenHardwareMonitor, as suggested in the answer for this question (Which of the ATI Dynamic Switchable Graphics are used when there is no "switching" utility? 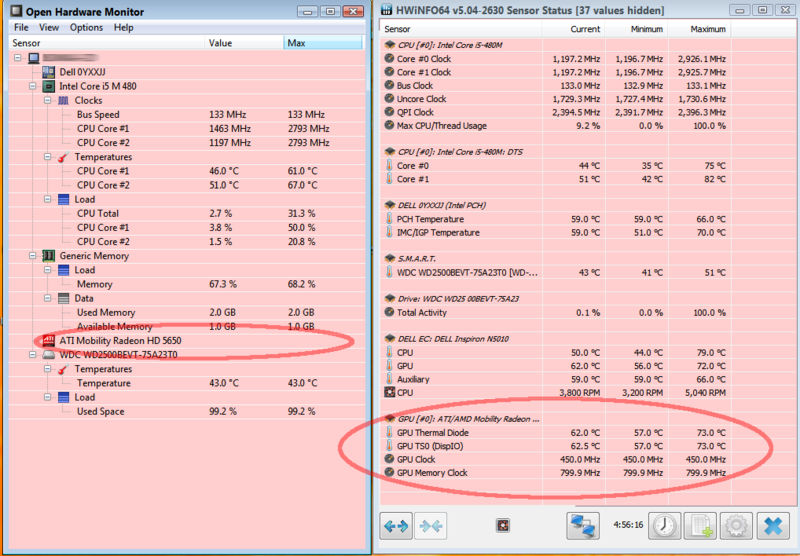 ), and its readings do not seem to be reliable as to whether the discrete GPU is engaged or not. That makes the accepted answer invalid. Also, my system is different from the system in the question because I do not have the integrated GP listed in the Device Manager. So - different system and no valid answer = not a duplicate. I made some more screenshots, hope that may help. I can not post images, so I can only provide the links. It is important for the troubleshooting to know WHEN the error appears. What do you do on your computer when it happens? Also, do you see both GPUs in the device manager or just one VgaSave? At this moment it can be anything from failing GPU to corrupted driver(s). Also, Windows uses VgaSave driver because you stopped the ATI driver to manage the ATI GPU in any way. You can identify the device this driver manages by going in to device Properties, click on tab "Details" and from the drop-down box select "Hardware IDs", which is usually second down. It should be in English or very nearly literal translation. which you can try to identify the device with here. Has anything changed before the error started? Drivers update, upgraded hardware, unexpected system freeze or black screen or anything? Is there anything else that happens in the system - errors, warnings, etc - which do not cause BSOD? Now things get interesting. This laptop has 1st gen i5 CPU, which should have onboard GPU (but please confirm - there are newer models with different CPU). But we have to be sure. Is there an BIOS option disabling it? If yes, enable it and see if you have Intel HD appearing in DevManager (yes, you should have TWO display adapters listed there if all is ok, second being ATI). If not, you have a laptop with just one GPU, which is the ATI. In that latter case and taking into consideration your info about BSOD it seems that indeed the Radeon has breathed it's last. In other words: I don't know what is going on, but it looks like with this laptop model you got either IGPU or ATI. Not both. Not sure it's how Dell chose it or ATI can't do it. 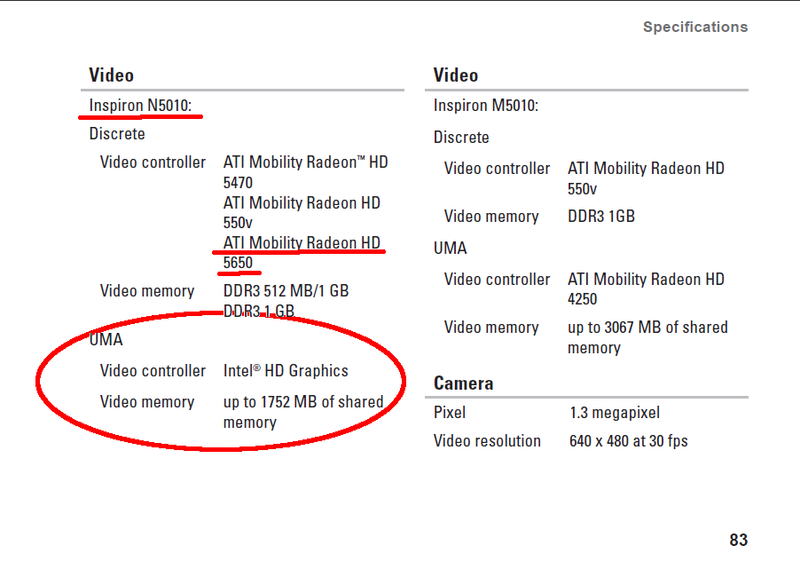 EDIT 3: N5010 with ATI discrete graphics is both not designed by Dell to be switchable and Radeon 5650 doesn't support it anyway. However, with soldering equipment one can bypass the faulty ATI chip and system will then work with IGPU enabled. But this is amateur work to say the least. So, it looks like the ATI chip is either faulty or the driver is corrupted. I recommend uninstalling all ATI drivers and any ATI software either manually or using ATI Uninstaller. When that's done do an extra reboot and then install driver provided by Dell on the product support page ONLY. If that works - all is well. If you're back to not working device in Device Manager it means the chip is failing. This is first and final warning you get before it stops working completely and you're left with laptop withe either black screen after turning it on or beeping error code(s). Right-click on your desktop and select "Screen resolution"
Click on the hyperlink that says "Advanced settings"
In the dialog box that appears, under the Adapter Type section, read the name of the component that is giving you picture. Not the answer you're looking for? Browse other questions tagged windows-7 laptop drivers graphics-card gpu or ask your own question. Which of the ATI Dynamic Switchable Graphics are used when there is no “switching” utility? Correct way to install drivers for a laptop? Is it possible to find out if my laptop with an Intel CPU has integrated HD graphics?